The whole spectacular world of golf comes to life in these pages - the great men and women players, both pro and amateur, the architects, the courses, the wonderful stories and marvellous images. 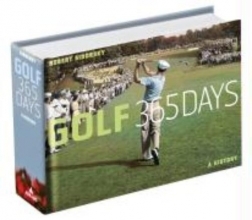 "History of Golf: 365 Days" covers not only the usual beginnings of the game to the present day but also golf around the world, and women's golf as well as men's. Individual players as well as beautiful courses are highlighted, with many interesting anecdotes. Sidorsky's narrative begins in Scotland, the home of golf's legendary origins and continues right on through the most recent tournaments and dramas, including mod ern phenomenon's such as Tiger Woods, Michelle Wie, Zach Johnson and Paula Creamer. A companion volume to Robert Sidorsky's "Golf Courses Around the World", "History of Golf" includes hundreds of pictures and detailed commentaries combine to create a source of endless interest and pleasure for any active or armchair golfer.